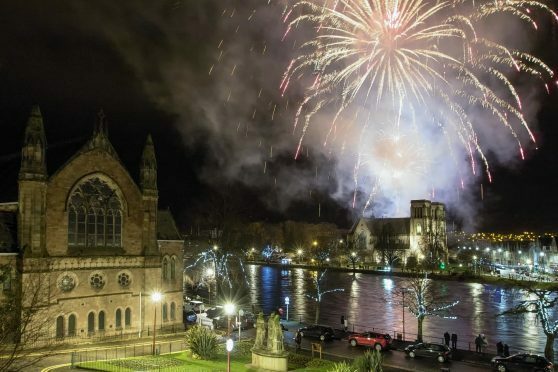 A massive midnight fireworks spectacular to bring in the New Year in Inverness could be seen for miles around the Moray Firth on Saturday. About 10,000 people from across the Highlands and further afield converged on the region’s capital for the event. Organisers believed it was a record crowd for the annual event, which has grown into one of the biggest party fixtures in the north of Scotland. Top bands The Elephant Sessions and Scooty & the Skyhooks were first on stage at the Northern Meeting Park while folk-rock band Skerryvore were the headline musical act for the Red Hot Highland Fling. One of the biggest cheers of the night was for local judo star Stephanie Inglis, who topped a dramatic year by taking to the stage to join hosts, comic Craig Hill and city provost Helen Carmichael, to lead the midnight bells countdown. Miss Inglis, 28, who is making steady progress seven months after a near-death motorcycle crash in Vietnam, took the opportunity to once again thank the many people who donated money to help fund her medical bills after it emerged that her travel insurance had expired. The event closed with a traditional burst of Auld Lang Syne – and only then did the rain resume.